UVX 7S was one of 4 identical Bristol LH's that entered service with Eastern National in September 1977 (UVX 4S - UVX 7S). All 4 had the less common 4-headlight style front. 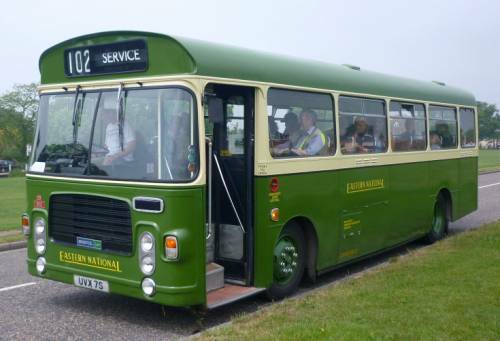 Her original livery was National Bus Company (NBC) Leaf Green, initially with a white band along the side. These were Eastern National's only Bristol LH's (Light Horizontal, referring to the engine) and were operated out of the Colchester (CR) Depot. They were intended for the lightly loaded and more rural routes in the area, but ended up operating on general routes out of Colchester. They were lively performers, but not all drivers liked the manual gearboxes and lack of power steering. Those that did, described them as fun to drive. The 4 Bristol LH's were sold as a batch to neighbouring Hedingham & District Omnibuses who put them into service in October 1982 wearing Hedingham's red and cream livery. UVX 7S had Hedingham fleet number L114. All 4 were mainly operated out of the Little Tey depot and were in service around the Colchester area though UVX 7S also spent time at the Hedingham depot. In July 1999, UVX 7S was withdrawn from Hedingham's Tollesbury depot, still in excellent working condition, and sold to company employee Dave Arnold of Maldon, who rallied her for several seasons. Dave Arnold also acquired sister vehicle UVX 4S which, being in good condition but less smartly turned out, was cannibalised - sadly the engine and other large parts were too large for storing as spares for UVX 7S. The remaining sister vehicles, UVX5S and UVX6S, went to Silver Star and were later scrapped. UVX7S spent a number of years in storage, albeit kept in working condition, and in June 2006 ownership transferred to Fred Lawrance of Colchester. In August 2007, UVX 7S was repainted in 1959-style pre-NBC Tilling Green and Cream, but retaining the Hedingham black front grille. As a 1977 vehicle, she never wore this livery while in service, but Fred considered it more elegant than the bland NBC all-over leaf green. This inauthentic and somewhat customised livery has since been a bone of contention among enthusiasts. Although the vehicle was lively and performed impeccably, she turned out to have dangerously low engine oil pressure and needed a bottom end engine rebuild (this was when UVX 4S's engine would have been useful!). She has also been reunited with her original Eastern National "1103" fleet number plaque, kindly donated by the enthusiast who had previously purchased it. 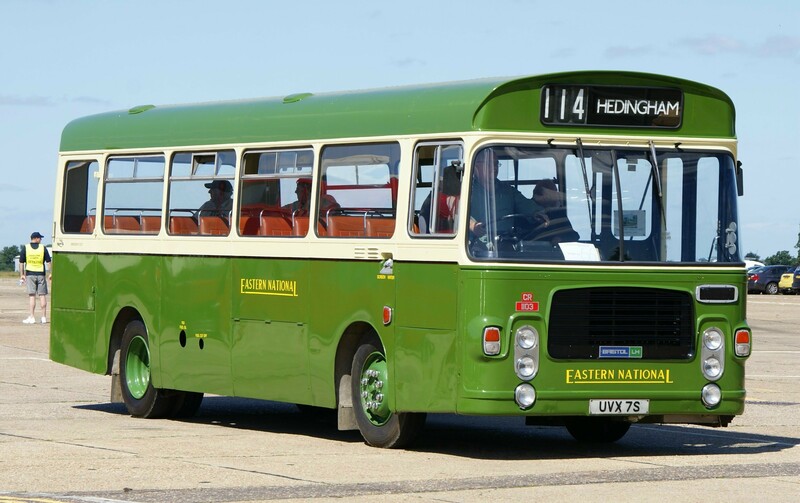 As part of the Colne Estuary Preserved Buses collection, she was rallied in Essex and further afield and nicknamed "Boadicea", alluding to her past and present travels around the Colchester area! 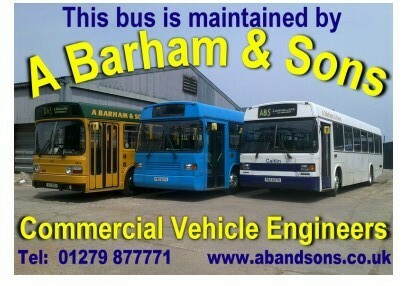 In January 2011 ownership was transferred to Sarah Hartwell who will retain this livery and rally her mainly in the local area. Sarah fell in love with Eastern National's Bristol vehicles while commuting to secondary school 1976 -1983 and though she never rode UVX 7S during this time, the LH's excellent condition and known history made her an ideal bus for a novice preservationist. UVX 7S remains part of Colne Estuary Preserved Buses where Fred Lawrance continues to provide advice and take an interest. Spring 2011 marked my debut in UVX7S aka "Boadicea" with a few practice runs under supervision and a rally at Great Yeldham. She's also been further afield with more passengers, albeit driven by friends with PSV licences. Not everyone likes "heavy" steering or manual gearboxes, but to someone who's never had power steering in a car, I felt at home with the controls. In October 2011, she underwent a through mechanical overhaul which ironed out a few issues and has made her quieter and smoother to drive. In 2012 an overhauled starter motor cured her intermittent starting problems. As with all older vehicle, there are idiosyncracies to get used to. She's a lovely vehicle to drive and we've trundled round local country roads and to Clacton seafront just for the pleasure of it. Some ambitions are worth the wait. And for nostalgia's sake - she often displays 311 HALSTEAD on the destination blind. As with all older vehicle, she has some idiosyncracies (notably when changing from 4th down to 3rd gear!). She's a lovely vehicle to drive and we've trundled round local country roads and to Clacton seafront just for the pleasure of it. For nostalgia's sake - she often displays 311 HALSTEAD on the destination blind. Every owner needs an affectation, so "Boadicea" still sports Fred's bling wheel nuts, to which I've added an oversized pair of large furry dice to match her livery - something else for the purists to complain about! Interior period detail is in keeping with 1977 being the Queen's Silver Jubilee. Since going into preservation, UVX 7S has been seen at a number of bus and classic vehicle rallies. The list below is incomplete and gleaned from the internet as I don't have full details of her outings with previous owners.